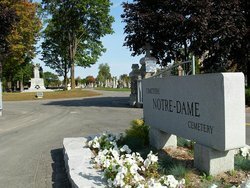 Notes: Notre Dame Cemetery, located at 455 Montreal Road, in Ottawa, Ontario, Canada, opened in 1872. It is the most prominent Catholic cemetery in Ottawa. The cemetery's western edge is located in Vanier, just south of Beechwood Cemetery. Its eastern limit is St. Laurent Boulevard. The cemetery is the final resting place for more than 114,000 persons.